A Software Reference Architecture (SRA) allows organizations to reuse architectural knowledge and software components in a systematic way and, therefore, to reduce costs. SRAs mainly appear in organizations in which the multiplicity of software systems (i.e., software systems developed at multiple locations, by multiple vendors and across multiple organizations) triggers a need for life-cycle support for all systems. Thus, SRAs are very attractive when organizations become large and distributed in order to develop new systems or new versions of systems. In return, organizations face the need to analyze the return-on-investment (ROI) in adopting SRAs, and to review these SRAs in order to ensure their quality and incremental improvement. The goal of this research is to envisage an empirically-grounded framework that supports organizations to decide on the adoption of SRAs and its subsequent design and suitability for the organization purposes. It helps organizations to harvest and arrange relevant evidence from the wide spectrum of involved stakeholders and available information and documentation in SRA projects. Such a framework is being shaped through an action-research approach between our research group and everis, an IT consulting firm. 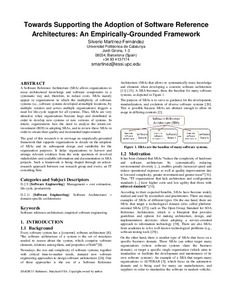 Martinez, S. Towards supporting the adoption of software reference architectures: an empirically-grounded framework. A: International Doctoral Symposium on Empirical Software Engineering. "Proceedings 11th International Doctoral Symposium on Empirical Software Engineering (IDoESE@ESEM)". Baltimore: 2013, p. 1-8.